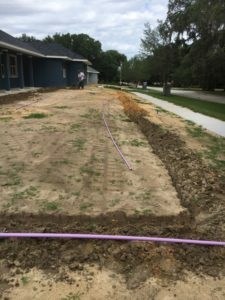 Irrigation repairs and installations don’t stop at your average builder home. Last week we had the opportunity to provide service on a newly built home by Habitat for Humanity in Oakland, Florida. The beautifully painted blue house with white columns is awaiting front yard installation of sod and plant material. 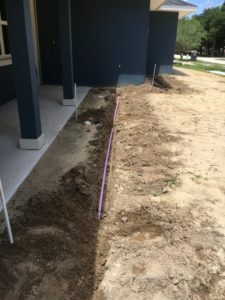 That means it was the perfect time for Total Sprinkler and Lighting to install sprinklers to ensure that everything receives the proper amount of water once its in. Below are some photos of the progress throughout the day. 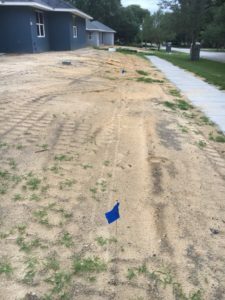 For this project our team reviewed site plans and made recommendations for irrigation system installation. Once approved, we were tasked with installing the system. We began by flagging out the zones and then got to work digging trenches for pipe. Once those were complete we jetted pipe under the driveway, glued everything together, added sprinkler heads, a timer, and a rain sensor. If it sounds like a big job, it is. Fortunately, we enjoy the work we do and we enjoy philanthropic work more. Habitat for Humanity is a great cause with a long lasting mission to address the issues of poverty housing worldwide. We are proud to have been a part of the larger team working to get this house ready to become a home. If you are interested in learning more, or would like to know what we can do for you, please give us a call.